Pro gamers and eSports athletes have a daily routine that is a lot more rigorous than most people realize. Over 60 hours a week to practice video games at a competitive level is very common and can put serious strain on the body over time. For most pro gamers there is no true down time and running off of 4-6 hours of sleep can cause health problems. Not only is there a mental exhaustion while playing, the physical strain on the upper and lower back can turn a lucrative six-figure career into a long-term health problem. Sitting long periods during just one session will cause a gamer to get muscle fatigue and this leads to poor posture, soreness and aching muscles. The “slouching” elementary school teachers warned students about is nothing compared to what takes place with eSport athletes. 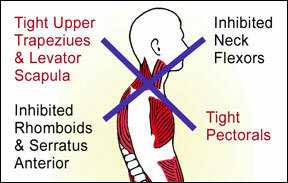 The poor posture can cause a disorder called upper crossed syndrome. This is the result of the muscles in shoulders, neck and chest lose their proper balance of function and lead to health issues. The muscles in the front of the neck and upper back become shortened and weak and other opposing muscles are overstretched. The most common activity that causes upper cross syndrome is computer use. Reading, biking, cell phone use and long-term television use have all been top causes for people suffering from this condition. The muscles that are “trained” in this position will create poor posture that can be challenging to correct if the activity continues. It is very important that the elite gamer and pro eSport athlete monitor how they feel while practicing or performing to avoid upper back pain. Simple steps such as using the best gaming chair, taking short breaks and performing stretches for just a few minutes during the course of the day can prevent a career being shortened due to injury and insure the gaming future of the athlete. If the symptoms of upper crossed syndrome have already started it is very important to pay attention to the amount of time being spent playing and to develop a plan that will prevent the problem from getting worse. A set time period to allow for stretching and breaks is the most important. Staying hydrated will also help. Avoid caffeinated drinks and sodas to decrease inflammation in the body that can also increase discomfort and interfere with the body as it attempts to heal properly. Hello again, Last week I mentioned and wrote about high ankle sprain injuries to athletes and how it can lead to postural problems and low back pain if the sports chiropractor they work with has not addressed the postural challenges of healing from the sprain. What also needs to be addressed is the need for the re-alignment and adjustment of the bones that were pulled out of place and involved in the sprain. This is key to have proper running mechanics and be able to restore agility, change direction and cut without pain. The technical term for a bone that is out of place but not fully dislocated is called a subluxation. A tibia and fibula subluxation is common after a high ankle sprain and may be uncomfortable after the actual sprain heals because the bones are still misaligned. Once the rehab gets out of the acute phase and manipulation can be tolerated the tibia and fibula bones should be evaluated and treated for subluxation to insure proper mechanics of the lower leg and ankle. Restoring the natural motion of the tibia and fibula is a fairly simple process and should not cause any pain when being adjusted. Performing as an elite athlete requires the body to be at its optimum all the time, not just for a couple of plays. The majority of professional athletes use sports chiropractic to make sure they do function at the highest level possible. Cobb Pain & Wellness Clinic works with athletes to help them achieve their performance goals and get to the next level. Hello again, Last week I mentioned and wrote about high ankle sprain injuries to athletes. What also needs to be included in that conversation is how the body will-over compensate with its posture because of the weight that cannot be placed on the injured side. 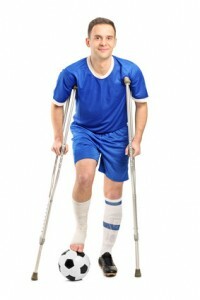 Whether crutches are being used or a cane or no support at all, when a part of the lower body is hurt due to a sprain it is natural to lean to the opposite side to take pressure off the hurt leg. The problem with doing this over the course of the injury is usually never mentioned. An excessive amount of pressure is placed on the opposite leg and hip which will cause postural problems that will lead to muscular imbalance issues, low back and hip pain. Along with handling the rehab for the actual injured site, notice and care must be given to the spinal column and core of the body to keep the bio mechanics in proper condition for the return to the court or field. A great sports chiropractor will make sure you are aligned properly and provide the specific exercises you need to address your injury. Hello again, Our local Atlanta Falcons receiver is suffering from a high ankle sprain which has limited his on field production. This type of injury is severe enough to decrease performance but not so severe where surgical intervention is needed. Typically high ankle sprains occur above the ankle and the pain is mostly felt when the foot or leg is twisted. Some athletes can still participate in sporting events with the sprain but this may run the risk of increasing the time needed for the injury to properly heal. The R.I.C.E method always applies with what should be done right after sprain injuries. In our office we also provide proper rehabilitation treatment to insure the tissue heals as fast as possible to get our patients back on the playing field quickly and making sure they are healed 100% and in game shape. Therapeutic ultrasound is great for assisting the body’s healing process and can reduce the time out of competition. Contact us if you have injured your ankle and need a great sports chiropractor to help. What do Jerry Rice, Sidney Crosby, Emmit Smith, Tiger Woods and Joe Montana have in common? They are all notable athletes that used chiropractic as a part of their training routine during their careers in their sport. Sports chiropractic is a branch of my profession that is gaining popularity and acceptance in an industry that has been tough to crack in the past. Our office has been a great asset to competitive athletes who are serious about taking their game to the next level by insuring they can perform at their best. Athletes in a wide variety of sports can benefit from sports chiropractic care. I understand the importance of the family who spends their weekends at AAU basketball tournaments in support of their son or daughter who’s seeking a college scholarship. Please contact us if you have any questions or to get more information about our sports chiropractic programs.